Payment Methods: Bank Transfer, Western Union, WeChat, Alipay. Would you like to upgrade factory BMW X5 radio with an aftermarket BMW X5 Android head unit? The original BMW X5 radio is old and has limited function, some are with a 7 inch screen navigation system but it's not easy to upgrade GPS maps, others are just with business CD and radio so don't have modern useful features like GPS, DVD player and Bluetooth. For those who have a BMW X5 E53 model you can upgrade the factory car stereo system with a new Android BMW X5 E53 navigation head unit replacement now. The new Android head unit for BMW X5 E53 comes with lots of features that you will love. Firstly, it's with a clear and responsive HD touch screen, easy for operation. Secondly, it's based on Android 8.0 system so you can download and install lots of apps including Gmail, Youtube, Spotify, Facebook and so on. Thirdly, Apple car-play is optional which can support iPhone connection. The replacement of BMW X5 radio also supports steering wheel controls and rear view camera video display. 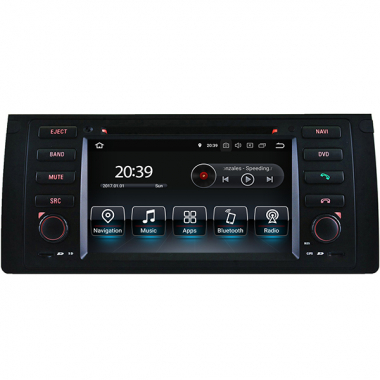 Car DVD player, FM/AM car radio, Bluetooth, USB, SD, WiFi, Mirror-Link are just basic features which nearly all BMW DVD Navigation are with those features built-in. No matter your BMW X5 comes with just business CD and radio or factory navigation system, you can upgrade and install this aftermarket BMW X5 radio replacement. The BMW X5 Android head unit fits well in the dash, because it's custom made to replace and fit the existing dashboard. If you have a question, why not contact us? We will explain to you and answer all your questions quickly and professionally.